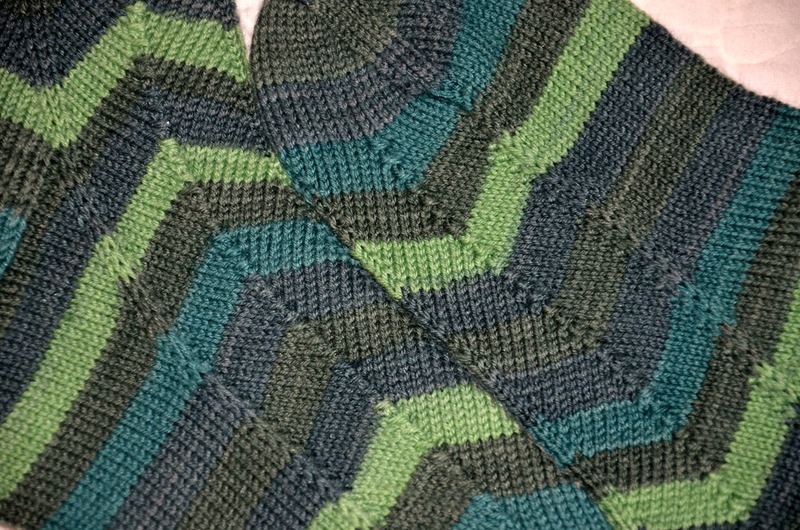 Colorwork... Just one more Row! After a few cuff modifications... I am off to the races on these lovely little colorwork mittens for a friend. I had forgotten just how much I enjoy the process and technique with knitting stranded designs. After much practice a few years ago, I learned how to do the Philospher's Wool technique of holding one yarn in each hand. Basically this means you "pick" with one hand and "throw" with the other. I like to hold the color I want to be dominant in my left hand (continental style) and the other color gets held in my right hand and worked like my usual style of knitting allows. I have never been good at knitting continental style, and I don't think I could work a purl stitch that way to save my soul... but for colorwork it just makes sense to me. Go figure. 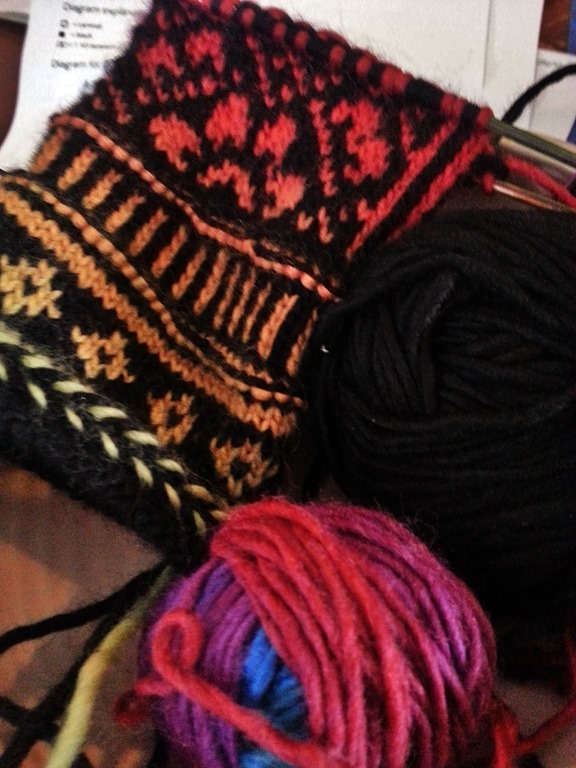 the plan is for these mittens to run the whole spectrum of color - starting with pale green, through yellow, orange, red, pink, purple, blue and back to green. I still haven't decided what should be done with the thumb. I'll figure that out when the time comes. Originally I had considered making a lining to double the warmth... but the nice tight gauge means that the fabric is already really thick. These puppies are going to be bulletproof even without any lining I think. I might try some alternate lining method... maybe weaving some strands of Angora inside or something after the fact. 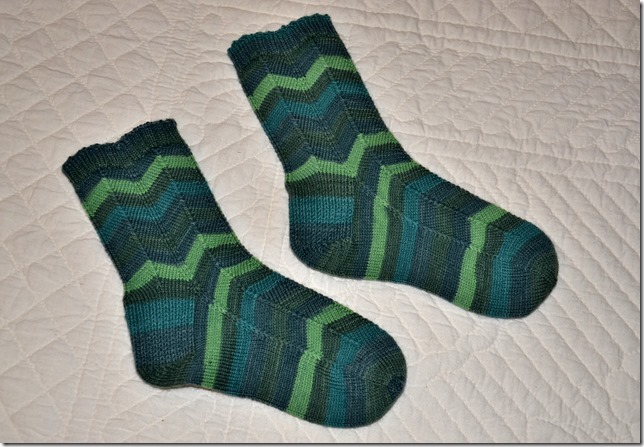 - why oh why did they discontinue this great self-striping yarn? It came in great colorways, and feels great even after being abused wearing in shoes and washer/dryer cleaning. - this pattern is a standby/go to favorite of mine... well written, easy enough to work on while watching tv, and interesting enough to keep my attention. I think it's my fourth pair... and likely not my last pair either! Knitting seems to help me feel more like *myself*  so I guess I should be making the effort to knit more often! which is full of great conversations about knitting socks, photos of the projects people are working on, and links to awesome yarns and patterns. One of their current fun Knit Alongs is for a year long series of projects (free patterns generously offered by Heatherly Walker) to be knit using yarn from ones stash. There will be prizes coming on the end of 2015, but what interests me the most is the opportunity to work along on something new each month. 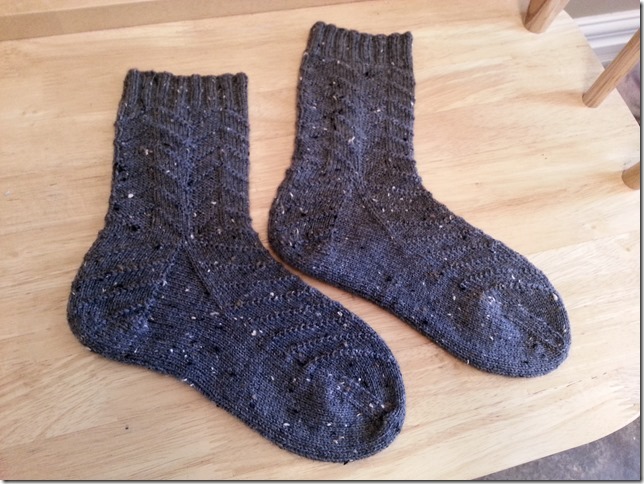 There was a time when I could polish off a whole pair of complicated lace socks in 3-4 days. A week was plenty of time to finish pretty much any kind of pattern. So I think it should be reasonable for me to try and complete one pair a month. and if I like it  to just jump in and knit it. If its really not my style or too complicated, Ill just pick something else and go for it. the Stroll line doesnt disappoint!